(San Francisco) A coalition of more than 30 national religious leaders gathered by Gaylesta, a therapy association for lesbian, gay, bisexual and transgender people, and Rev. Rebecca Voelkel, Faith Work Director for the National Gay and Lesbian Task Force Action Fund and Convenor of the National Religious Leadership Roundtable, have endorsed Senate Bill 1172, which will protect minors from damaging psychological abuse by licensed mental health professionals who falsely claim they can change their sexual orientation or gender expression. Authored by Senator Ted Lieu, SB 1172 is co-sponsored by Equality California, the National Center for Lesbian Rights, Gaylesta, Mental Health America of Northern California, Lambda Legal, and the Courage Campaign. “We see the heartbreaking effects of this deceptive and dangerous psychological abuse and we know that, as religious leaders, we must say no. No to injury, no to suffering, no to the pain it causes. Our religious traditions call us to affirm the worth and dignity of all God’s children – these practices denigrate that which is sacred in all people and they must be stopped,” said Rev. Rebecca Voelkel, Faith Work Director for the National Gay and Lesbian Task Force Action Fund and Convenor of the National Religious Leadership Roundtable. The lesbian, gay, bisexual and transgender faith leaders who spoke in favor of SB 1172 see firsthand the deep psychological, emotional and spiritual effects of the damaging attempts to change the orientation of LGBT minors. They also feel that this is a moral issue, upon which they must take a firm stand, recognizing the intrinsic dignity and perfection of all LGBT youth. 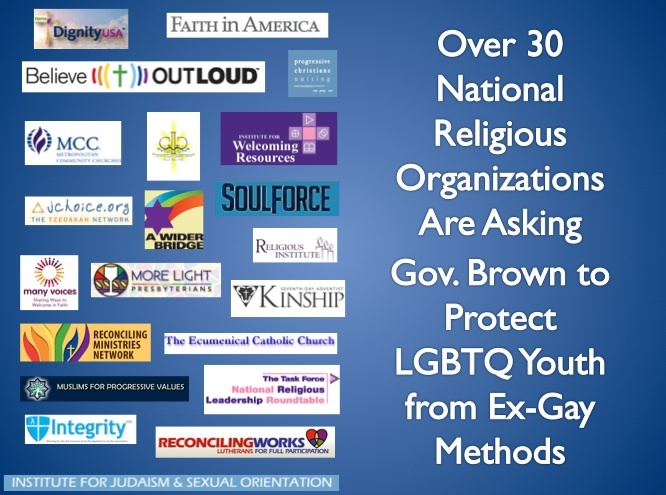 The faith leaders who have registered support for SB 1172 have sent letters to Governor Jerry Brown, urging him to sign the measure. Governor has until September 30th to sign or veto the bill or it will become law on January 1st, 2013.